What are we on here? Numero 7? Yup, you guessed it. This is another Hollyburn skirt. 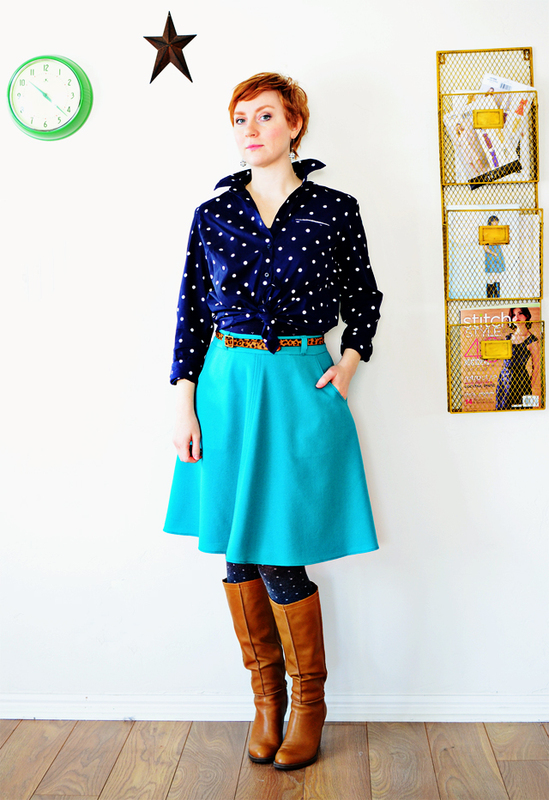 (And for those of you just joining me, the Hollyburn is a most beloved skirt sewing pattern put out by Sewaholic). I'll not sport too much with your intelligence about this make. It's wool crepe - a favorite fabric of mine. Who knew this bright aqua would be so exciting? Yowza. This one is shorter than other Hollyburns I've made and as per, fully lined. I had to do a polka dot top again. Who knew that my rapidly growing button-up collection looked so cute tied at the waist with this skirt? Loving this look, which I'll have you know, I've never sported before. Now for some meat and potatoes. I had plans to make this skirt in this wool crepe anyway, but after a fairly harrowing button-up shirt experience, this got pushed directly to the top. It's one of my TNT's (tried and true pattern) and it's a definite sew-jo inducer. I cut this out one day and sewed it up the next - well, all except the hem. I let that hang for a few days. From there I jumped right back on the sew-jo wagon and got to work on another button-up for myself and then cut out a tweed dress, which has been reduced to a pencil skirt, but more on that another time. I decided a few things after this make. First, all projects must be finished - I am no longer going to do UFOs. Second, when a pretty hard sewjo killing project is over, it's time to whip out a sewjo inducing TNT. At first I thought, well, that's not going to be very fun, I don't have that many TNTs. When I started looking around, surprisingly, I have MANY TNTs. I have 3 skirt patterns, a button-up shirt, a pair of slacks, jeans, a jacket, a sheath dress and a t-shirt. That's a wardrobe right there, if I'm not mistaken. Third, after every sewing project is completed, my personal sewing room must be cleaned up and made ready for another project. I don't know about you, but when I sew in a really, really messy room, I tend to get nothing done because I keep looking forlornly at the mess and wondering what to do! Last, but not least on my efforts to keep my sew-jo alive, I've decided to start creating lists of projects to complete and get ready for. I love the scheming part of sewing, but more often than not, the scheming is where it ends because I forget. So I've decided to employ a list of inspirations and also a list of my next sewing project plans. This helps me plan better and from there, I create more outfits instead of white elephants. What do you do to keep your sew-jo around? Tips and tricks? I also force myself to finish my project or else I get stuck at the "oh I just need to do the hem" stage. As long as something isn't 100% finish, I'm not allowed to take out anything else.. so my stitch itch kicks in and tells me to just finish it. I don't have TNTs yet (except maybe a shirt pattern) but since I've sewn so little so far, and have a good variety of patterns, I get back into it pretty quick since everything feels like a completely new experience. I clean off my table between each project, but unfortunately not the fourniture I keep all my stuff... I am oh so very due. Just received a luvverley parcel of wool crepe from you yesterday - thank you - the colours are very yummy. At the end of every project I mend something. I figure it takes less time to mend a detail than to cut a whole new garment and that means things are returned to our wardrobes quick smart. Sometimes the mending is to fix a detail in something I've made that is sub par - if you know what I mean! I always clean up my sewing room after the cyclone of sewing strikes. I have never been able to work in a messy room. I'm sewing mundane things for others at the moment, but after this I reckon I've done the unselfish sewing for this year - then it's back to clothes for meeeeee! I love your skirt and completely agree with your sew-jo principles. I've been following those same "rules" for a while now, and it definitely keeps me on track. Best wishes! Am I the only person in the world that doesn't know what "sew-jo" means? Oh, that "just need to do the hem" phase gets me every time! I'm just the same way! I find it so hard to accomplish anything when my sewing room is a mess. Love the skirt, what a great color! I just keep sewing and sewing. If I stop, it is hard to start again. Also, I try to do an easy project after a hard one. Love the skirt and blouse. Whoops! Sorry! Instead of "mojo" it's sewjo! Ha ha! How stinking cute are you?! I love it!! I love the color! You look great! Love it! Have to make a hollyburn. I have the Lonsdale dress, probably that is in the TNT category? (Pattern sitting around, nothing made from it?) No idea what you mean by TNT but it is in the realm of a dream, with fabric and a pattern but not cut out, sewn, or finished? Tri Nitro Toluene? I love the turquoise! 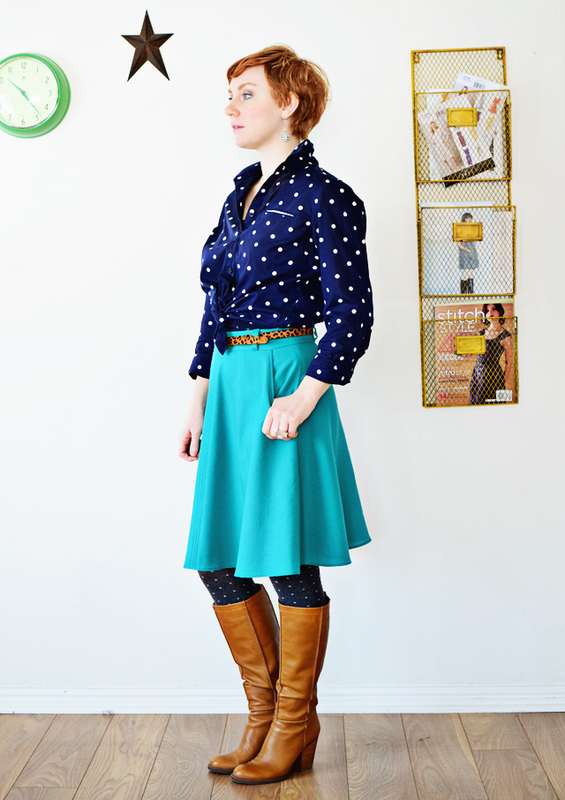 And the polka dotted tights to match the shirt, wow! And great blurb about you in the recent Vogue Magazine. Time for you to do another Craftsy Class. The color is so, so pretty. I've never made a sewaholic pattern but I've always admired this one. Love it! I'm also a big fan of no UFOs, clean the mess and do an easy project when I'm tired!! Even just a quick set of pjs helps me get back into the mood! I hang my skirt parts once they are cut, then I sew from the top of the skirt down on all seams. Since I rarely have time to cut and sew in a day, most of the hem hangs out wonky *before* it's sewn. Lazy bum that I am, I just even out the skirt to my normal 1+1/2+ to the back vs. front and call it good. Just makes it easier! Finishing a garment for a specific event is the trick to finishing UFOs, I've learned. I had a dress three quarters of the way done for a whole year. I finally finished it so I could wear it to my engagement party. I finally finished a shift dress that had been sitting around for two years so I could wear to my bridal shower. Ok, so I look like I was just going on a whole bragging spree about getting married. What I mean is that, "Hey, I could totally wear this dress to that event next month" = motivation to finish. I'm telling ya, it works. 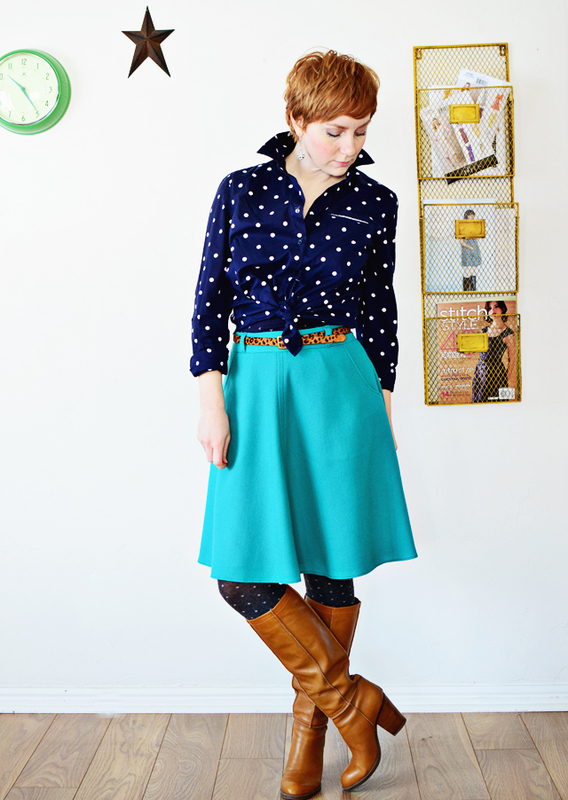 I love this skirt and your button up! Your TNT list sounds perfect to me. I find button up shirts and jeans to boost my sewjo - I don't know why, but they are both super satisfying to me. TNTs always help too. Great skirt design, but what I really love is the quirky styling. Bright blue, leopard print and polka dots - sound insane but it works! I am so glad to read that other people have to have a tidy sewing room. I hate having to spend time looking for things I need. Sewing is a new hobby so as yet I don't have any TNT patterns, I am hoping making simple things for the sewing room will restore any lost sewjo. I'm sure i'll need it after binding the whole of my wrap around dress in satin bias tape. I completely agree with Alison's comments that an occaision gives you motivation. I have been putting off making the bias tape (all 7 yards of it) but after signing up for an Australian Sewing Guild industry day where everyone wears their own creations I had the extra incentive to get on with it. love your whole outfit! And I think I need to follow some of your sew Jo boosting activities! TNT is short for Tried N True. Something you turn to over and over. So if you have a pattern that you know you can just pull out and make up successfully because all the pattern alterations are done and you know it will fit just right, you have a TNT pattern. For me, I'd call my Hudson Pants a TNT. I've made 5 of them. I also have a princess seamed sheath dress that I think I can call TNT. Usually, I can leave my current project on my dress form next to my desk and feel motivated to complete it, but lately I've been moving on to something else before things get done. I'm trying to correct that this week and knock out two "current" items before moving on. Blog reading helps kick start the sew-jo, but you have to be careful, or like you say, you never get past the planning (and often purchasing) stage. Much of my stash fabric is in my office closet. As it has no doors, I can sit at my desk while working during the day gazing at all the pretties and daydreaming. After joining the Stashbusting group in January, I logged all my fabric and patterns into Evernote Notebooks so that I can browse them like my very own personal FREE online shop. It's working because...well, see my first paragraph for proof! Thanks for sharing! Since My husband and I downsized, I no longer have a sewing room. Now I sew in a guest bedroom and all my sewing "stuff" (pattern, instructions, sewing machine booklet, fabric, etc) end up on the bed and on my sewing table (loose pins, measuring tape, scissors, pin cushions, thread). So I walk in and tell myself to put away 10 things. I do and it relieves some of the unneeded stress I feel when I walk into a messy room. I enjoy reading everybody's ideas and thoughts. I love this outfit, so colorful! I can't afford to make a mess, I sew on my dining room table, so whatever comes out must be put away when the seing is done - that's another kind of sew-jo kill as sometimes it's hard to get motivated to get everything out again. When I don't have time to sew, I look at my lists and dream about what I could be sewing... like I said, list nerd, but it certainly does keep the sew-jo going! My sew-jo is always high at the end of het winter. When it is still cold outside but it makes sense to sew clothes for spring. When the weather is nice enough to wear the clothes I have made it is nicer to spend time outside. 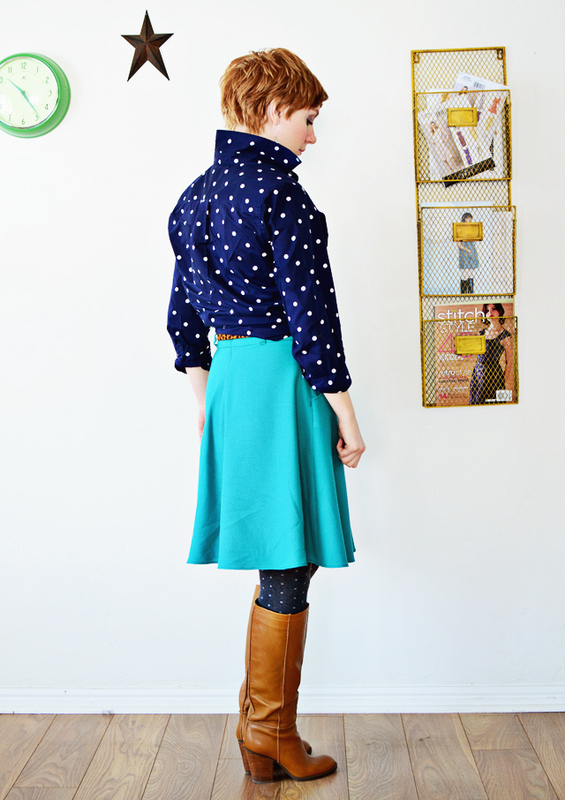 I would never have thought to pair navy and white polka dots with turquoise and leopard, but it looks awesome! You look great! Cleaning up the sewing area is a must-do! I get so confused if everything is messy and I'm still in the middle of some project that I'm having a hard time finishing. When I am losing sew-jo I work on a pattern drafting project because drafting really stimulates me. Anyway, I love your Hollyburn skirts. It's so great to find something that just works, ya know? Oh man, that colour! All of it is just delicious! Finishing a hard sewing project is tough to rebound after. I do usually try a craft project or a TNT pattern. I did organize my patterns by category during our last snow storm - and put all my TNT patterns together labeled. I do need to get a few more TNT's - you have a great collection of TNTs! I need to get better at cleaning up before jumping into my next project too. 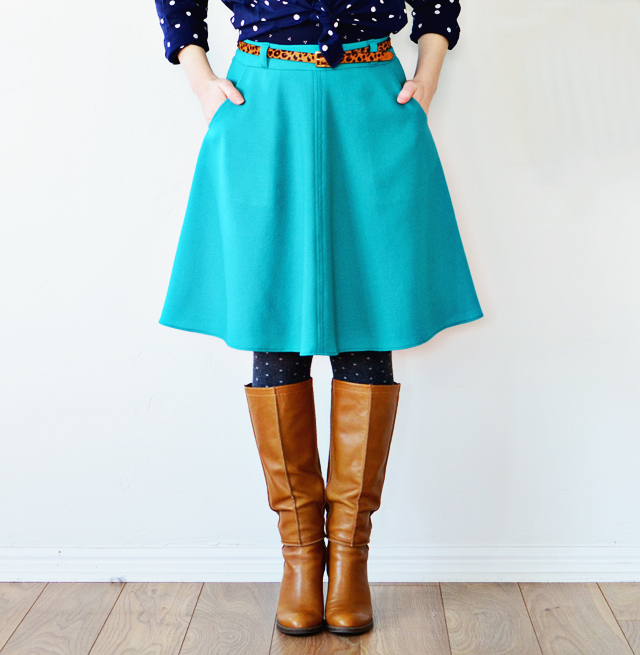 I love your skirt and completely agree with your sew-jo principles. OK, I now have my Hollyburn pattern and am excited to try it. And I like the idea of the contoured waistband, but I notice on Sunni's body, it looks like the waistband is about 1.5" below what I would consider my "waist". And, I am more round than Sunni, so while the hips will fit, the waist is too small. So, I might make my #1 Hollyburn like the pattern shows, with a regular waistline and straight band, just so I can get the waist/hip sizing figured out before I try to be creative with the curved band. Skirts are cooler in the summer, so I need to get sewing! And, it's the weekend, a good time to sew! I think this is a great idea! When I did the contoured waistband tutorial, it was meant as a solution for those who might find that the straight waistband didn't flatter them as much as they would like. Sometimes it's not for everyone, it's just a trick if you find you could use a little contouring in that area. Awesome idea for the glossary! I will get right on that! Thanks for the tip Judi!